Kaidrei likes to get into Malea's crib mostly to play with the mobile hung above it. 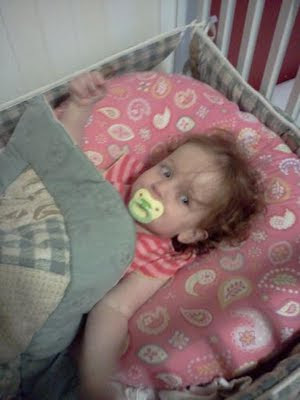 One day last week, she found Malea's pacifier, put it in her mouth, laid down on the pillow, and pulled the blanket over her. Hmmm, do you think this is a subtle hint that she needed more attention that day instead of Malea (who had been fussy all morning...thus had more attention than normal)? Kaidrei pretending to be a baby!